Matthias Heiderich, known as Heartbeatbox on Flickr, is a photographer from Berlin. We recently came across his work at his exhibition in the Mission District of San Francisco and asked him questions about his background and photography. Heartbeatbox, you are stating that you are a self-taught photographer. How did you get started and interested in photography? I have yet to receive photographic training or attend photography courses. I was quite simple when I started taking pictures and eventually taught myself the technical basics. I occasionally notice that I’m unfamiliar with some photographic techniques, because they’ve never been important for my type of photography. As for how I have come to compose my work, I’ve clearly been inspired by other photographers. I spent a lot of time exploring the work of others and gradually found the direction of my photography. My primary interest is in architecture and the many possibilities of photographically representing buildings. I practically had no interest in photography until I turned 27. I was previously a linguistics student who focused mostly on music in my spare time. My first favorite photographers were people whose work I encountered online on sites such as Flickr, and at some point I felt the desire to do something visual aside from music. Flickr has been a huge source of inspiration for me right from the start. It helped me find my own style and, above all, a reason why my interest in photography grew at all. On Flickr I found some of my favorite photographers, and only afterwards I discovered the big names in photography history. If I were asked today about my favorite photographers, I wouldn’t mention the big historical names. I would bring up ones from my contacts list on Flickr instead. What was your first camera and, if you had to pick just one camera to shoot with from now until the end of time, what would that be? The first camera that I’ve bought myself was a Pentax K20D. This camera was always with me on my first trips to Berlin and served me well always. I still take pictures with it every so often. As time went by, I added many more cameras, especially analog medium format cameras and Polaroids. If I would have to pick one, it would most likely be a Yashica Mat 124G. Considering the lifetime of certain parts of that camera, I would need more than one. In any case, the camera is really beautiful and produces amazing image quality. Tell us your favourite photos on Flickr, and why you like them. First, a favourite from your own photo stream? The tree in front of the painted wall in Berlin Reinickendorf was a lucky find and the reward from an extended photo-trip on a cold winter day. … And from another Flickr member? Kurt Manleys Flickr photostream is amazing and he is one of my favorite photographers. What’s one tip that you would share with someone who’s just picking up a camera? Please use the HDR effect sparingly. Tell us more about your thoughts around your series “Spektrum Berlin”. 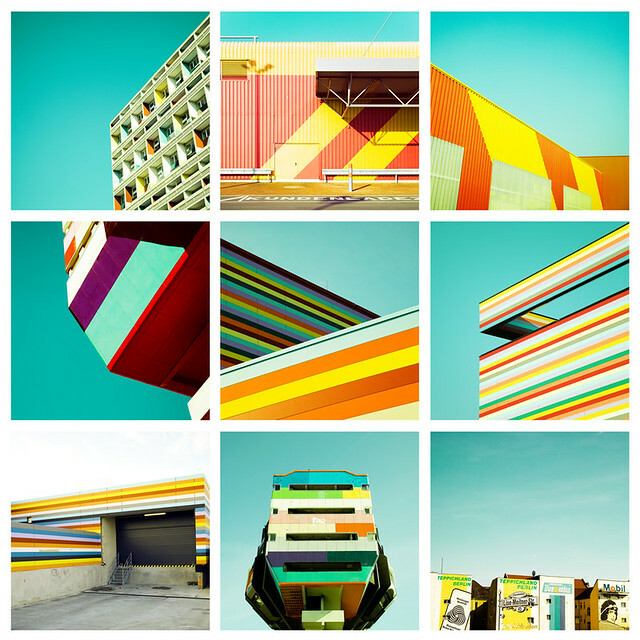 “Spektrum Berlin” is an ongoing project in which I photograph the colors and shapes of Berlin’s urban landscape. Basically, there isn’t a big story behind each and every photo. It’s concept photography and more or less a continuation of what I started in the Color Berlin series. The series is purely artistic, meaning that I’m taking artistic freedom to edit and design photos in the way that I like them personally. It’s not about true and realistic reproduction of objects. Instead, it’s about expressing my personal perspective through subjective idealization of subject matter in selected environments. Your work from the series “Spektrum Berlin” is currently exhibited in San Francisco. Are there any other exhibitions plans anywhere else soon? In addition to my exhibition at the Carte Blanche Gallery in San Francisco until September 19, I have a tentative plan for an exhibition in Berlin this fall. A 2013 exhibition in collaboration with an architectural firm is scheduled in London. Details are being discussed, and I’m immensely excited about these upcoming opportunities. Matthias, thank you for the interview. Find more of Matthias Heiderich, a.k.a. Heartbeatbox on Flickr, in his photostream. Neil Armstrong (August 5, 1930 – August 25, 2012) Photo from nasa hq photo.